This fault code suggest that there is a problem along the Air/Flue route. According to manufacturers instructions, the exact meaning is that there is ‘air/flue gas duct fault’. In order to repair this fault we suggest a few basic checks in order to determine if an engineer visit is required for determining if this fault is being caused by another component. First check that the flue outlet is not restricted in any way. See diagram above. Check that there are no bushes or tree coverings obstructing the flue. Also from outside, check there are no obstructions in both the inner and outer tube. vaillant front case no 2. 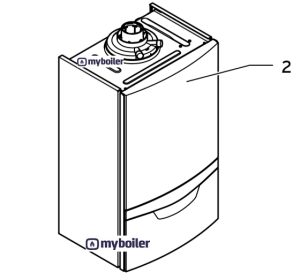 If you are unable to inspect the flue, it would be a good idea to remove the front outer case (item 2 shown in diagram above) of the boiler to determine if the flue needs further investigation. This will allow the ventilation air to be taken from the room instead of the outside. The gas flue products will still continue to go directly outside unless that part of the flue is blocked, in which case you would get a different fault code. There is also a final posibility that there is some form of internal blockage on the inlet of the fan, preventing air from being pulled in. This would require an engineer to investigate further.